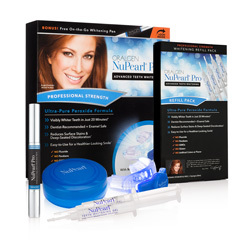 • Includes Bonus NuPearl®32x Perfecting Whitening Pen! Enjoy the benefits and quality of professional teeth whitening in the comfort of your own home for a fraction of the cost. 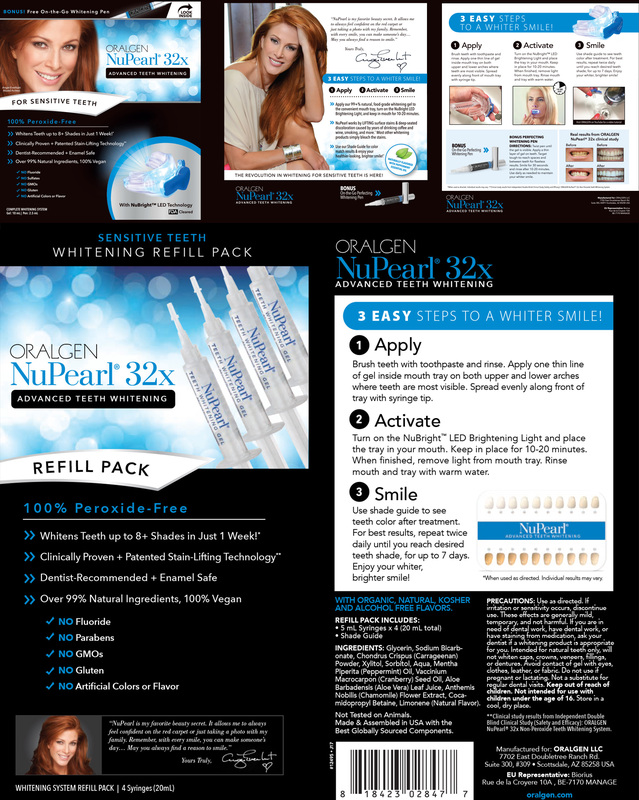 NuPearl®32x is a dentist-recommended, natural, peroxide-free system with NuBright™ LED Technology, advanced botanical whitening gel, and natural peppermint essential oil, providing visibly whiter teeth in just minutes. Reduce the damage caused by years of drinking coffee, wine, smoking, or eating foods that can stain teeth by removing surface stains and deep-seated discoloration without damaging enamel and without painful sensitivity! While many people desire the results of bleaching, at-home whitening products contain large concentrations of chemicals that can damage healthy teeth and gums. NuPearl®32x is natural, safe for enamel, gentle on teeth, and will not cause your teeth to become sensitive. It’s also free from harsh ingredients, including: Latex, Parabens, Sulfates, Sodium Fluoride, PEG/PPG, and is Gluten-Free. See significant changes in tooth color without the damaging effects of other whitening processes that can harm sensitive teeth and gums. To keep the results you achieve at the dentist, you’d have to return time and time again, which gets expensive! It’s easy to use the NuPearl®32x Perfecting Whitening Pen together with our Whitening System to maintain the bright, white smile you want between treatments or on-the-go. 3 Easy Steps to a Whiter Smile! The NuPearl®32x Advanced Teeth Whitening System is comparable to expensive whitening treatments offered in a dentist’s office. The procedure is similar – the natural whitening gel is applied to teeth while our exclusive NuBright LED technology uses low intensity lights, emitting high levels of brightness in a single direction on to the whitening gel, delivering professional results in just minutes! How Does the Perfecting Pen Work? The NuPearl®32x Perfecting Whitening Pen uses advanced whitening gel to deliver maximum results. Just release the gel into the brush applicator and apply to each tooth. Smile for 30 seconds, and rinse off in 15 minutes. The gel goes to work in just seconds for visibly whiter teeth! EXPERT TIP: After applying gel, turn on LED light tray and place in mouth to enhance the gel’s whitening power! Keep on teeth for up to five minutes, then rinse. 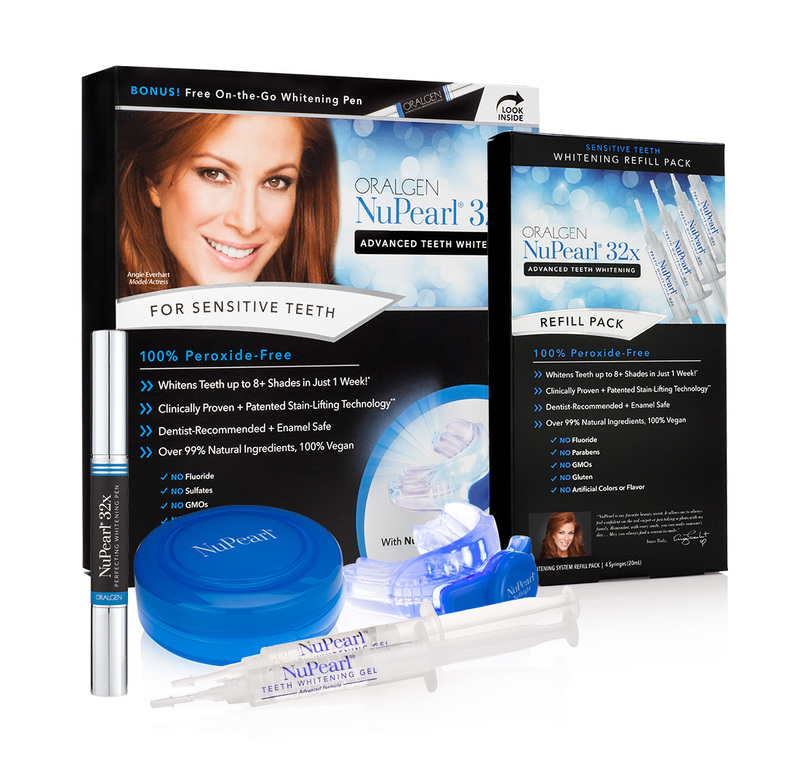 Value Pack Also Includes: Oralgen's SYSTEM REFILL PACK with 4 additional syringes of NuPearl.32x ADVANCED TEETH WHITENING SYSTEM so you can so you can maintain your brighter, whiter smile! GEL & PEN INGREDIENTS: Glycerin, Sodium Bicarbonate, Chondrus Crispus (Carrageenan) Powder, Xylitol, Sorbitol, Aqua, Mentha Piperita (Peppermint) Oil, Vaccinium Macrocarpon (Cranberry) Seed Oil, Aloe Barbadensis (Aloe Vera) Leaf Juice, Anthemis Nobilis (Chamomile) Flower Extract, Cocamidopropyl Betaine, Limonene (Natural Flavor). With organic, natural, kosher and alcohol free flavors. Ingredients: Glycerin, Sodium Bicarbonate, Chondrus Crispus (Carrageenan) Powder, Xylitol, Sorbitol, Aqua, Mentha Piperita (Peppermint) Oil, Vaccinium Macrocarpon (Cranberry) Seed Oil, Aloe Barbadensis (Aloe Vera) Leaf Juice, Anthemis Nobilis (Chamomile) Flower Extract, Cocamidopropyl Betaine, Limonene (Natural Flavor). Apply 0.5 mL (approximately one thin line) inside tray from the NuPearl®32x Whitening System on both upper and lower arches. Spread evenly across front side with syringe tip, targeting visible teeth. Eliminate the timely and messy process of creating custom molds with our convenient, One-Size-Fits-All tray! Turn on the NuBright™ LED Brightening Light and place the tray in your mouth. Keep in place for 25 minutes. When finished, rinse mouth and tray with warm water. Repeat once daily until you reach desired shade, for up to 10 days. Use shade guide to see teeth color after treatment. Enjoy your whiter, brighter smile. Twist pen until the gel is visible through the brush tip. Apply a thin layer of gel on visible teeth. Smile for 30 seconds and rinse after 25 minutes. Use daily as needed. Precautions: Use as directed. If irritation or sensitivity occurs, discontinue use. These effects are generally mild, temporary, and not harmful. If you are in need of dental work, have dental work, or have staining from medication, ask your dentist if a whitening product is appropriate for you. Intended for natural teeth only, will not whiten caps, crowns, veneers, fillings, or dentures. Avoid contact of gel with eyes, clothes, leather, or fabric. Do not use if pregnant or lactating. Not a substitute for regular dental visits. Keep out of reach of children. Not intended for use with children under the age of 12. There are no customer reviews.